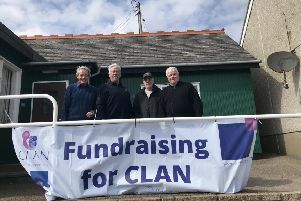 The Stonehaven Tennis Club held its fourth annual Grand Prix over the weekends of March 17-19 and 24-26. The final weekend was played in blistering sunshine and packed a crowd of spectators enjoying some exciting tennis matches. Varada Kamate of Cults Tennis Club took the ladies title; Patrick Young of Stonehaven Tennis Club won the mens title. Patrick snatched the title from Bruce McIver – also of the Stonehaven club – who has retained it since the tournament began in 2014, until now. Men’s Singles Event - Patrick Young beat Kieran Hamilton 6-1, 6-0; Steven White beat Kieran Matthews 6-0, 6-1; Fergus Hermiston  beat Calum Parr 6-4 6-4; Gino Pezzani beat David Stead 6-4 6-3; Lewis Findlay beat Benjamin Hine 7-6(8) 1-6 10-7; Bruce McIver beat Aaron Parr 6-4 6-0; Jonathan Gordon beat Peter Kennedy 6-0 6-2; Martin Harbord beat Louis Duthie Gray 6-0 6-1; Patrick Young beat Steven White 6-0 6-1; Fergus Hermiston beat Gino Pezzani 6-0 6-2; Bruce McIver beat Lewis Findlay 6-1 6-0; Martin Harbord beat Jonathan Gordon 6-1 6-1; Patrick Young beat Fergus Hermiston 6-0 6-1; Bruce McIver beat Martin Harbord 1-6 6-1 11-9; Patrick Young beat Bruce McIver 6-3 7-5. Ladies Singles Event - Jemma Critten beat Hannah Anderson 6-2 6-2; Christina Kirkwood beat Jenny Munro 6-3 6-4; Varada Kamate beat Jemma Critten 6-1 6-1; Karen Crawford beat Christina Kirkwood 6-2 6-1; Varada Kamate beat Karen Crawford 6-4 6-4.